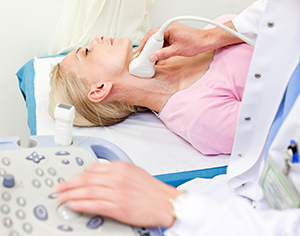 What is a carotid ultrasound study? Ultrasound studies use high frequency sound waves to produce images of various parts of the body. Carotid ultrasound captures images of the carotid arteries located on both sides of the neck. The carotid arteries carry blood from the heart to the brain. It is a painless exam with no restrictions or special instructions before or after the test. Carotid ultrasound studies are often performed to detect narrowing in the carotid arteries. Carotid ultrasound is often performed if a doctor hears a high pitched sound called a bruit through the stethoscope. Patients with strokes or mini-strokes may be referred for a carotid ultrasound. Patients who have undergone carotid stenting or carotid surgery may also be sent to have follow-up carotid ultrasound studies. How is this study performed? The patient will be lying face up on an examination table. A clear gel is applied to the neck area which allows the ultrasound waves to travel through the body. A small wand-like instrument called a transducer is placed firmly against the skin and images are recorded by the technologist. You may hear noise during the exam, which is the sound of blood flowing through the arteries. For carotid ultrasound studies, wear comfortable clothing with a loose fitting collar. The exam takes approximately 30 minutes.